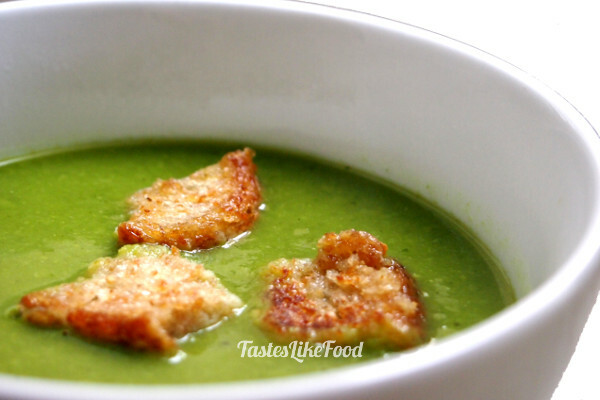 Traditional Polish green pea soup. Truly, fast favorite at our home. Maybe because it’s creamy, smooth and super fresh. Or maybe thanks to the terrific crunchy garlic croutons that we always make as an integral part of this “duo set”. And yeah… it’s actually hard to say whether we end up eating more soup or more croutons. We love them both! Wash well and chop leek, celery root, parsley (both the root and the leaves) and shallot. Defrost the green pea by leaving it for a while in a bowl filled with cold water. Fill a medium size pot with half a litre of water, add all the veggies together with the bay leaf, black pepper and allspice. Bring to a boil. Remove the bay leaf. When the soup cools down, blend it with a hand mixer until creamy. Put the soup back to the stove and heat it up, but do not bring to a boil again. Add salt and freshly ground black pepper to taste.